South Africans watched as the country’s Parliament erupted into a brawl just a few sentences into President Jacob Zuma’s State of the Nation Address (SONA) on Thursday Feb. 12. Security was called in, punches got thrown and members of one opposition party were forcibly removed. In the aftermath of the ejection of some members, other opposition members of Parliament (MPs) staged a protest by walking out. After the scuffle the President stood up, chuckled and continued as if nothing had happened. Before the SONA had begun there had already been a protest from journalists as parliamentary officials had installed jamming devices that scrambled the cellular signal, allegedly to stop them reporting from inside the chamber. Some members of the media saw State Security Minister, David Mahlobo, being called out of the chamber. The Deputy President, Cyril Ramaphosa, apparently sent him a message asking him to correct this. When he returned a few minutes later, so did the cellular reception. A number of people have claimed that this was part of the government's ploy to limit the country from seeing what they had planned to respond to any opposition in the House. It’s a chilling part of the drama that unfolded—for many South African’s this was an assault on freedom of the media. For a number of weeks firebrand leader of the young radical Economic Freedom Fighters (EFF), Julius Malema, had threatened to ask President Zuma during the State of the Nation Address when he will #paybackthemoney. This has become a familiar phrase and hash tag in South Africa. Public Protector Thuli Madonsela, has ruled that President Zuma spent over $27 million of taxpayer’s money on upgrades to his own private residence. A few months ago Zuma was asked the same question—"When will you pay back the money? "—by Malema in a sitting of parliament. He did not answer the question; this angered Malema who would not sit down when asked to do so by the speaker of the National Assembly, Baleka Mbete. He was then forcibly removed from parliament. Zuma has, since then, avoided appearing in parliament. He denies the allegations even though the public protector issued a report finding him guilty of misappropriating funds and suggested he pays back the money. The EFF was formed by Malema and other disaffected ex-ANC members after their expulsion from the ANC. They contested an election for the first time in 2014. They won 6.35 percent of the national vote, which gave them 25 seats in parliament. In contrast the ruling African National Congress (ANC) got 62.5 percent of the vote and 249 seats in parliament. Despite their relatively small numbers the EFF have changed the face of the South African political spectrum significantly with their radical views and actions. The pomp and ceremony of the opening of parliament and the SONA took an ominous turn against this backdrop. Just minutes into Zuma’s address the secretary general of the EFF, Godrich Gardee, stood up and asked Zuma when he would pay back the money. He was asked to sit down; he refused, and soon all the EFF MP’s were on their feet. The speaker asked the Sergeant at Arms to remove them. All of a sudden the Parliamentary Chamber was filled with men in white shirts and black pants. These security officials (we remain unsure of who they actually were—parliamentary security, members of the South African Police Services or military) grabbed, punched and dragged Malema and other EFF MPs out of Parliament. Some of them tried to resist and fight back. 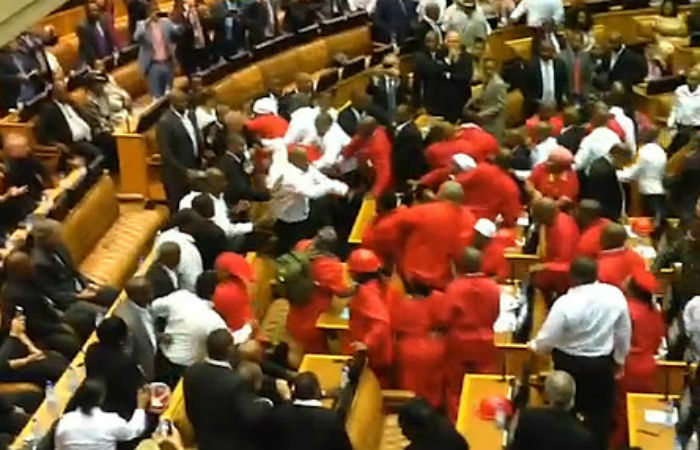 ANC MPs clapped and cheered as the EFF members were removed. Zuma himself sat, surrounded by security, and watched on as members of the opposition were assaulted. Reports are now emerging that claim some of these security personnel were armed and members of the police service. This is unconstitutional and opposition political parties are threatening legal action against Parliament. When all the EFF members were removed the speaker of the largest opposition party, the Democratic Alliance (DA), asked who the security personnel were—parliamentary security, the South African Police or a branch of the military. The speaker could not (or would not) answer the question. The DA then stood up and all their members left the House as a protest against the presence of the unknown security in the House. Other smaller opposition parties also decided to stage a walk out. When everyone had left, Zuma returned to the podium and after making a throwaway remark about continuing after he was interrupted, and chuckling, proceeded to read the rest of his uninspiring speech. He tried to address a number of issues, including the problems the country faces with electrical generation, unemployment and a minimum wage. Somehow all of this seemed surreal because the elephant in the room was the very speaker himself and his own questionable behaviour and unwillingness to be accountable. Zuma, in many ways, brought on the spectacle South Africa and the world witnessed that night. Even worse, however, is that this happened in the very room international moral icon, Nelson Mandela, had stood and delivered a number of SONAs. The South African Constitution, considered to be one of the best (and most liberal) in the world, says that it is the duty of the president to promote “the unity of the nation and that which will advance the Republic” (83 c). Zuma, in his presidency, has failed dismally. South Africa today is more divided—politically, economically and socially—than what it has been since the dawn of democracy. On this night too the freedom of the press was, worryingly, also insulted. While the behavior and actions of opposition parties themselves can be called into question the one big issue that has defined the state of the nation is Zuma’s inappropriate use of public money and his refusal to be accountable. At SONA 2015 the President, ANC and opposition parties betrayed the people of South Africa and, sadly, Nelson Mandela himself.